With Tanaza, network deployment, configuration and management are done 100% remotely, for increased efficiency and cost savings. Firmware upgrade is done remotely, so your infrastructure is always updated with the latest software version. Tanaza’s zero-touch deployment allows you to remotely provision and configure multi-vendor WiFi networks. If you use different manufacturers’ devices, Tanaza provisions its features across your multi-vendor access points in no time. It also consolidates your network, so that the procedure to apply a configuration to an access point is the same for all devices, independently from their brand. Once you connect the Tanaza Powered AP to the internet, and you claim it through your Tanaza Cloud account, you’ll be able to configure every aspect of your WiFi network through the cloud. With Tanaza, on site visits are a thing of the past, as you are able to troubleshoot your network, upgrade the firmware, reboot access points and apply new configurations from remote. 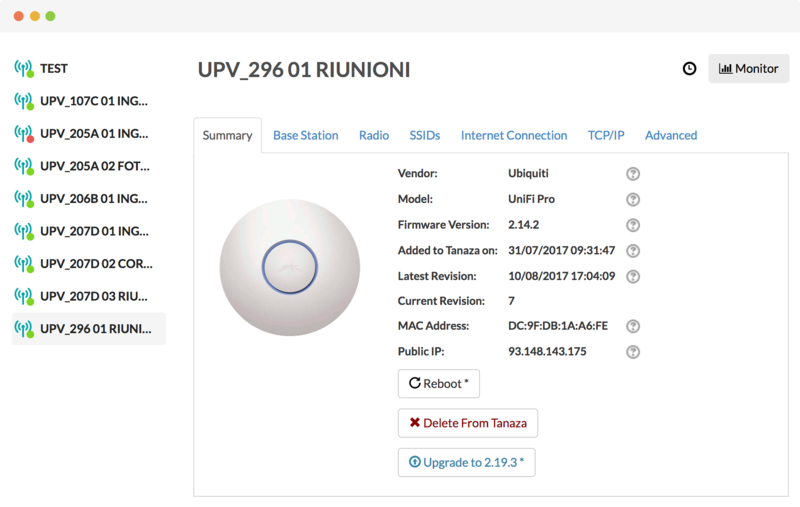 Tanaza Cloud allows viewing your access points’ details, such as vendor, model, firmware version, MAC address, public IP, date the AP was added to Tanaza, latest revision date. You can rename the devices, manually or automatically reboot them, and upgrade the firmware from the cloud. You can change the devices’ radio configurations, automatically or manually select channels, change Tx Power, and channel width, from the cloud. Also, you can enable dynamic IP addressing, or alternatively change the IP address of the access point, change the subnet mask, the gateway, the primary and secondary DNS server. Although you have great flexibility in setting up your network, there’s no risk to disconnect it by approving a wrong configuration: Tanaza features “auto roll-back”, which means that its Cloud platform remembers the last working configuration of the AP and restores it, in the case your device gets mistakenly disconnected. With Tanaza, networks recover themselves and stay operational, even if any of your colleagues applies the wrong configurations. In addition to this, you can fully configure your SSIDs (up to 8 per access point): you can set them bridge mode, create NATs, and change the DHCP server. Tanaza allows you to configure the SSID visibility, clients’ isolation settings, and set bandwidth limits per SSID and per client. For each SSID, you can configure the access mode: with password, open, with Tanaza’s captive portal, or with an external splash page. In the case someone uses your network in a wrong way, you can block that MAC address from accessing your network again. Also, for each SSID with captive portal, you can select session timeout and idle timeout and the limit of sessions per day/client. You can quickly replace any of the access points you’re using, if you need to. If you want to substitute your device with a more performing one, or if an access point in your network is broken or stolen, you don’t lose any of your previously collected statistics. The Cloud platform saves your splash page setting and stores information about your customers, so that you can just replace the broken AP with a new one and enable the SSID on it, and it’s like nothing ever happened.